Ishan Aditya is Project Leader at the POA Educational Foundation for “Healthy Minds” project (Addiction, Incarceration & Suicide prevention and Quest for Excellence). He is a Third year Undergraduate Student of McMaster University’s Bachelor of Health Sciences (Honours) Program and Canadian Institute of Health Research (CIHR) Student Award Recipient as well as Student Researcher (Department of Pediatrics, McMaster Children’s Hospital). Ishan has been responsible for conducting a translational research study aiming at understanding the molecular mechanisms behind adolescent idiopathic scoliosis and also designed a project investigating the molecular mechanisms behind skeletal muscle inflammation in the metabolic syndrome which received a Government of Canada $5000.00 Student Research Grant from the Canadian Institute of Health Research(CIHR). For the past 16 years, Ishan has trained in Martial Arts and is a Black Belt in Goju-Ryu Karate and is a firm believer in following a disciplined, meticulous approach to his work. As an aspiring clinician-scientist, Ishan believes in effective communication skills and is an involved public speaker & debater who represented Canada at the World Championships for Debating and Public Speaking and Intel International Science and Engineering Fair. 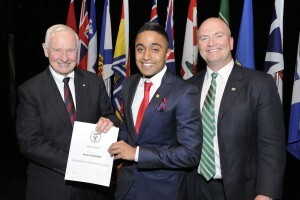 He was also the top scholar of his high school, as well as the recipient of the Duke of Edinburgh Gold Standard from The Governor General of Canada for his efforts in community service and leadership and Lieutenant Governor’s Community Volunteer award. Ishan has been ecomentor trainer and facilitator for Earth Day Canada, a volunteer instructor at ComputerCamp4Kids, youth volunteer at the Arizona/Mexico border and in Kenya, medical volunteer at VIDA in Costa Rica, Arts and Crafts program volunteer at McMaster Children’s Hospital and volunteer in the operating room (OR) family support program at McMaster Children’s Hospital. Ishan has been the Jr. Executive Coordinator of McMaster’s Smiling Over Sickness Club (which raised over $20,000 towards Camp Trillium and McMaster Children’s Hospital), an editor of the Meducator- McMaster’s undergraduate health sciences journal as well as a member of the Health Sciences Musical. Canadian Natives suffer disproportionately and at an alarming rate health problems in the areas of addiction, violence, suicide and cardio vascular problems compared to rest of Canada. Ishan has led a new initiative at the POA Educational Foundation from nurturing entrepreneurship to Healthy Minds projects by bringing together eminent health researchers, resources and connections of POA Educational Foundation and matching research grants from the government and philanthropist and native leaders. It is an amazing feat of Ishan to bring this research focus for Native health and assemble a very potent group of stakeholders.